The commencement of the fourth industrial revolution has opened up unparalleled business opportunities, it has also increased the inevitability of a cyber-attack, and businesses need to be prepared. Cyber-attacks are on constant rise and with every passing day attackers are becoming more advanced with their plans. There is a persistent need to stay up-to-date with the world of cybersecurity. 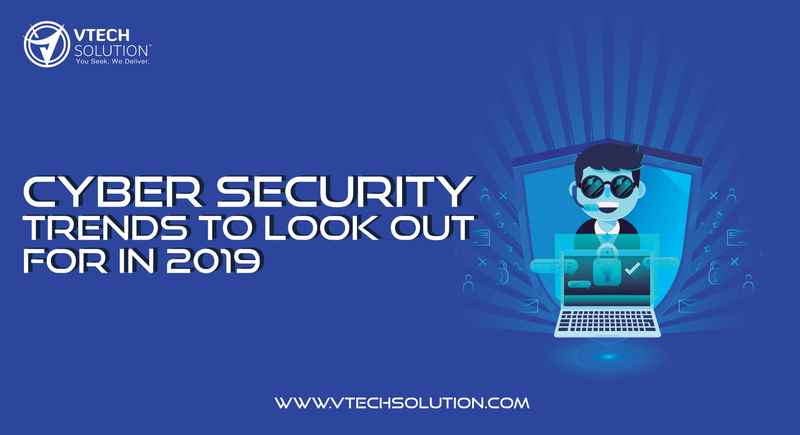 Here are some of the broad cyber-security trends that we’ll see in 2019. Artificial Intelligence has the ability to “learn” – to progressively adapt its code from the data collected without external programming, so there is less room for mistakes. It also learns how to advance its techniques, evade countermeasures deployed, in real-time, becoming more efficient and precise. AI powered cybersecurity attacks will shape the cyber practices for all organisation across the globe. As reported by Webroot, approximately 87% of US cybersecurity professionals use AI in their cybersecurity strategy. 91% of cybersecurity professionals are concerned about the use of AI in cyber-attacks. According to a report by PwC, 27% of executives of organizations plan to invest in machine learning and AI powered cybersecurity safeguards. Sandboxing technology is used for the detection of malware and preventing them from infecting the system. In this method, malware are kept in a controlled environment to see and study their behavior. However, new malware has been programmed that can watch out for themselves and identify and detect if they are in a sandbox and prevent themselves from executing their codes until they come out of the sandbox and actually execute those malicious programs. These types of malware are sandbox-evading and are expected to be a rising trend in upcoming years. The use of IoT (Internet of things) devices is increasing day by day and so is the threat of an attack using botnet of infected devices. In 2016, Mirai botnet was used to launch a DDoS attack on DNS provider Dyn that included 50,000 to 100,000 infected and enslaved IoT devices such as cameras and DVRs. IoT devices do not hold much information as they have little memory and can store only relevant action data. The likeliness of one paying a ransom to retrieve the device in case of its hacking is less. However, there are a few devices which hold far more importance such as, power grid systems and if cybercriminals hack such devices, they have the capacity to shut down the whole system, resulting in heavy financial loss. A recent example involves researchers who hacked into two cars and wirelessly disabled the brakes, turned the lights off all beyond the control of the driver. A study by Verizon confirmed that 63% of confirmed data breaches involved weak, stolen or default password. This is because many organizations still use a single factor authentication. Experts recommend the minimum strength of a password to be of 13 characters to avoid a successful brute force attack. The emerging trend is to follow multifactor authentication and IT admins across the globe are pushing for it. New and advanced technologies are emerging in the world of cybersecurity, that could help companies safeguard themselves more effectively. For example, remote browsers are being used to isolate the browsing session of a user from the network. Deception technology is being used to detect, analyze and defend the system against zero-day and advanced attack methods. Decoy systems like Honeypot are being used which imitates a real system of a company holding the confidential data working as an active bait to is and block them. 2019 is expected to see more advance cybersecurity techniques in order to comprehend the increasing threats. There is a shortage of skilled cybersecurity professionals and this will be a challenge for many organizations in immediate years. Companies are unable to fill the vacant positions even after offering luring packages. In order to overcome this gap, companies have started outsourcing their cybersecurity needs to IT firms who are quite proficient in cybersecurity. This trend is expected to grow in 2019. It’s crucial to be more mindful of cyber-security at a personal, as well as, on an organizational level. Businesses that invest in security measures to minimize the risks of a data breach will definitely have a competitive edge. The problem needs to be tackled by joint efforts of public and private collaboration and with international bodies adopting a more rigid approach to cybercrimes. Regulatory laws must be updated while encouraging education and awareness about growing cyber threats. Knowing these trends could be a significant advantage to a professional in order to safeguard themselves and their organization from cybercriminals.